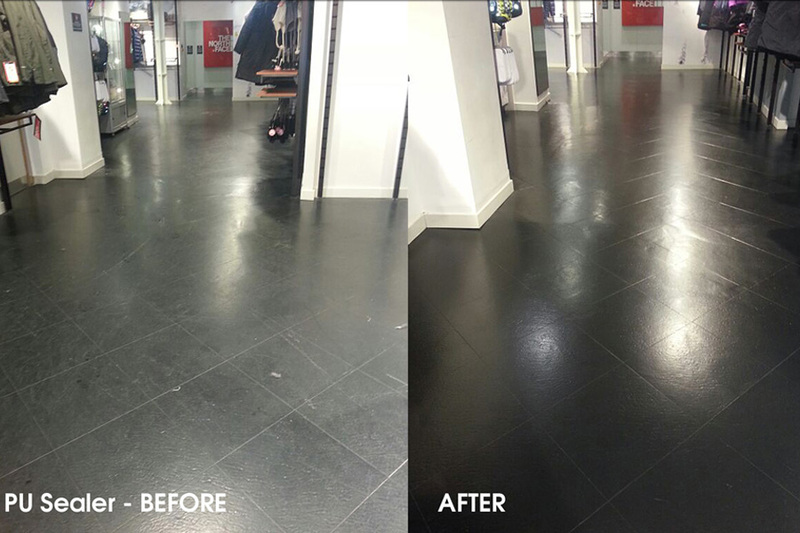 Northface in Covent Garden have been given an uplift in appearance when Beaver Floorcare attended site and coated 400m2 of black Amtico tiles with Dr Schutz PU Sealer. We were contacted directly from Amtico technical division (as their preferred supplier) to assist with an important client of theirs to restore the appearance of the black Amtico tiles following 4 years of heavy wear and poor maintenance. With an important visit pending imminently, we carried out a trial on 2 tiles to determine the result possible which totally wowed the client and instructions were given to treat the entire shop before the American CEO visited in 5 days. We completed the works in two shifts before the visit was due to take place to the delight of Sir Bob Brigham. After the works were complete we supplied the store with the 3 year warranty for the PU Sealer along with the correct cleaning equipment and chemicals to maintain their floor on a daily basis.